Tipping the scales at more than 20 stone, McDowell was one third of the formidable pack which took the inaugural 1987 World Cup. After making his international debut against Argentina in 1985, McDowell was a mainstay in the pack for the next six years alongside Michael Jones, Sean Fitzpatrick and the Whetton brothers. Despite being what can only described as a unit, McDowell possessed deft hands which could unlock even the most battle hardened defences. 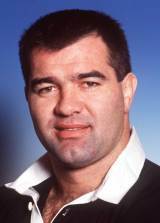 In 1989 McDowell was the only All Blacks first-teamer to play in the combined Antipodean side which played the British & Irish Lions - with the ANZAC team losing 19-15. McDowell was later the victim of a managerial change in the All Blacks backroom staff when new coach Laurie Mains took the reins. He was unceremoniously shown the door after their 1992 series with Ireland but will be fondly remembered as part of the impressive All Blacks pack.